According to the Human Development Index, Haiti is the poorest country in the Americas, and its lack of the most basic human needs rivals anywhere on Earth. Those needs, especially clean water, have multiplied drastically since the 2010 earthquake. In part due to rampant waterborne diseases, Haiti has the highest infant mortality rate in the Western Hemisphere. Even before the earthquake, 45% of its population lacked clean water and 83% lacked basic sanitation. We checked on our past project in Despinos Haiti in May and are so excited to share with you the difference it is making in that community! It's providing clean water for a children's home, school, and neighboring community, making a HUGE difference in the health of all those who use it. 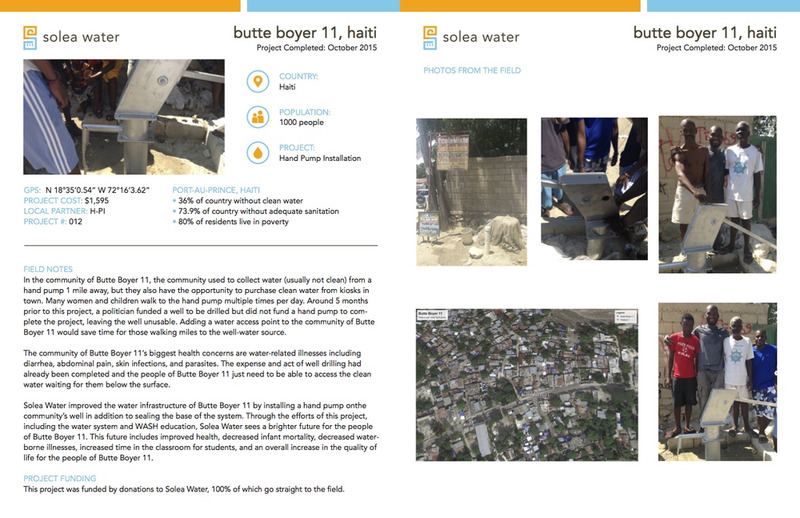 Click on the thumbnails below to read the full project report for each of Solea Water's projects in Haiti. They're also on our project map.